Hemet West hosted the annual CSA any doubles tournament from July 23-27, 2018. A total of 96 players took part in this event. Games were 12-frame, doubled, with players changing sides at half time, taking their discs with them. ATM’s Lynda Goggin and Carole Anderson, scorekeeper, Nelda Lichtwald, head ref, George Hayner and a three man crew maintaining the boards in a professional manner: Paul Epps, Ken Norris and Charles Smith. Funding was provided by The Bank of Hemet and Hemet West Management. Many thanks to them for that. Three businesses contributed 21 wonderful gift certificates and cash: Chili’s Restaurant, Red Robin Gourmet Burgers and Applebee’s Restaurant. One can only surmise that these winners ostensibly articulated the essential elements of shuffleboard success: sound decision-making, checking the scoreboard, maintaining their balance and rhythm in shooting and patience. It’s always an honor to acknowledge the winners. Amber Brown and Jack Anderson (Hemet Muni). Georgia Marchand and Gerry Abbott (CCC). turkey sandwiches and Hawaiian chicken salad, with a drink, chips and a cookie. Again, many thanks to all volunteers and players working together to make this such a successful event. Jim and Beth Allen Arrive in High River Alberta!! 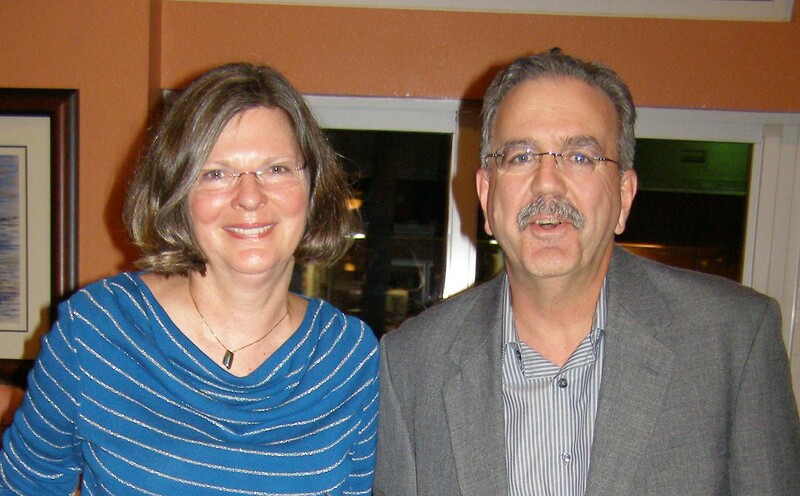 Jim and Beth Allen Speak: Anticipation. One of the greatest emotions we as human beings are blessed to behold. Today Beth and I are filled with great anticipation as we roll into High River and greet our shuffling friends from all over the world. The 37th World Championships start Monday, but in reality they begin the moment you see a friend in the hotel lobby, or maybe even in the airport. Or maybe just a Facebook post from a traveler. For I believe there are 2 events in High River- and each carries tremendous importance to us all. The games themselves are one event, and who takes home medals are yet to be determined. Anticipation of the victory – and the optimistic spirit all competitors enjoy at this moment runs rampart to each and every player. 2018 CSA SINGLES, SUN CITY, CA. Congratulations to Sun City’s any Singles Tournament held Monday, July 9 through Wednesday the 11th, 2018. There were 60 registered participants representing Colonial Country Club, El Grande,, Golden Village Palms, Foothills of Hemet, Hemet Muni, Hemet West, Sierra Dawn Southeast, Seven Hills and Villa Del Monte. On behalf of the District 7 tournament team and it does take a team to have a successful tournament. From the Board Crews, the ATMs, the Referees and the Scorekeepers. I would like to extend a thank you to all. Especially to those scorekeepers and referees who were not playing and came out to help anyhow. As this Tournaments Head Scorekeeper it was my pleasure to have so meany volunteers respond to my call and needs. It’s hard enough to fill Karla’s big shoes she is sorely missed. Congratulations also goes to the following players who won their divisions. ​for the ​​​​Consolation division we had​ (r-l)First Place Jay Davidson, Second Place David Ruch, Third Place Amber Brown, Fourth Place Georgia Stufflebeam. International Shufflers Ready to Rock at High River Alberta. Heritage Inn Classic Singles. June 6th to June 9th. 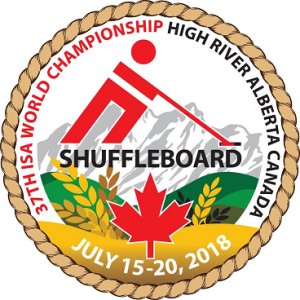 Players from around the world will soon travel to High River for the 37th International Shuffleboard Association (ISA) World Championship, and local organizers are eagerly anticipating their arrival. 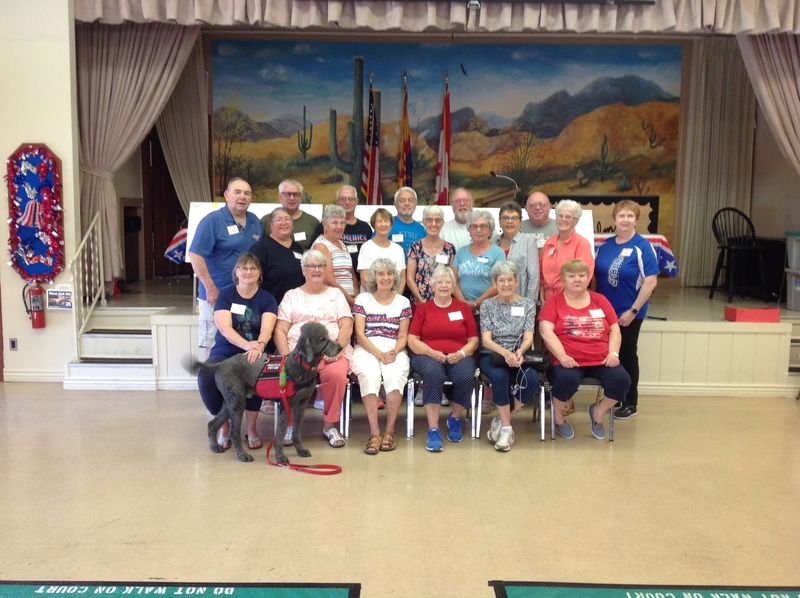 Ken Wardley, vice president of the Foothills Shuffleboard Association (FSA), said they initially applied to the ISA two years ago and received confirmation of the town being the host site in October 2016. The competition takes place at the Bob Snodgrass Recreation Complex from July 15 to 20. 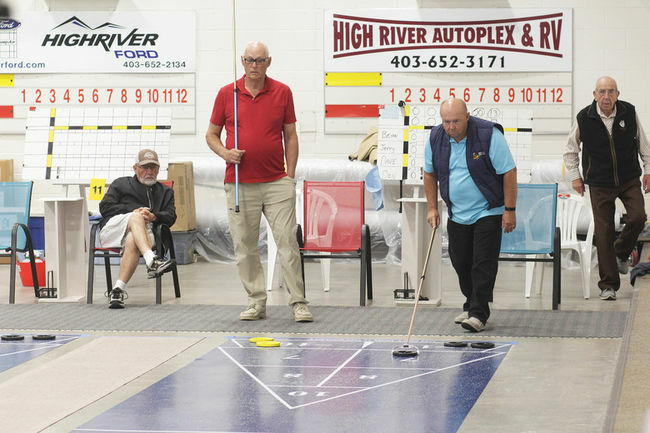 “One of the biggest things is certainly having the exposure of shuffleboard in High River (and) hopefully we’ll have a lot of spectators who will watch this international play,” he told the Times. A First Look At Royal Palms’ Rooftop Shuffleboard Court in Chicago!! SENT ALONG BY DAVE KUDRO, FSA PRESIDENT. My Love; Lois. The Celebration of Life for Lois McCormack (McConnell) will take place at Celebrations Hall, (Mackey Funeral Home) 35 Lindsay Street North, Lindsay ON. Celebration will begin at 11 a.m. and continue until 1 p.m. on June 22nd, 2018. Family, and any who wish, will then travel to the Groveside Cemetery, 5155 Baldwin St. South, Whitby, ON where Lois’ Ashes will be placed adjacent her son Jeffrey. Light lunch will be provided. My Love of 62 Years left us on June 4th, 2018. 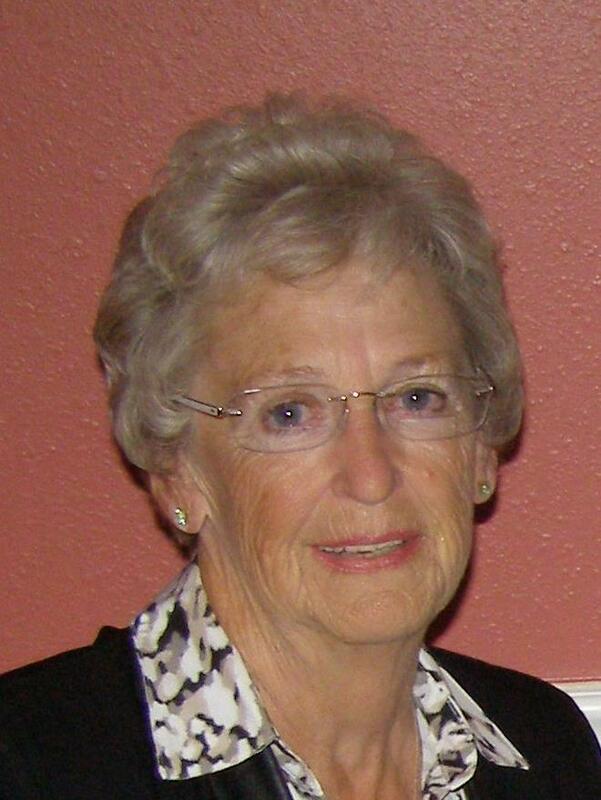 Lois McCormack had severe and aggressive lung cancer. It took her life while she was in the hospital in Lindsay Ontario; she had declined further complicated treatment, choosing to let “nature take its course”. Nature did so after only two days in hospital, Stan holding her right hand, daughter Michelle, holding her left hand. See You In High River!! Organizers of the World Shuffleboard Championships coming to High River in July are really having to wear their “planning” hats these days. Ken Wardley, who’s in charge of the event, says getting the over 100 players, who are coming from around the world, off their planes and into High River is a major undertaking.